Weingut Gunderloch is one of the top producers of Germany. It is located in the small village of Nackenheim in Rheinhessen. This town is situated on the banks of the Rhein in the Rheinterrasse area at the foot of the Rothenberg. This is the famed hillside vineyard site which Nackenheim is known for. Weingut Gunderloch also owns vineyards in the nearby Nierstein in the Red Slope (Roter Hang). It all started in 1890, when the banker Carl Gunderloch purchased the Gunderloch manor house in Nackenheim. As the story goes, he used to trek from Gundersblum, his place of birth, to his bank in Mainz. On these journeys he carefully observed how the sun played off the hills along the Rhein terrace. Based on these observations he purchased vineyard property that appeared to collect sunlight most efficiently and founded the Gunderloch Estate. Today, Weingut Gunderloche is still in the hands of the Gunderloch family, with Agnes Hasselbach-Usinger, a descendent of Carl Gunderloch, and her winemaker husband Fritz Hasselbach recently having handed over to their son Johannes Hasselbach. My wife Annette Schiller and I had the pleasure and honor to participate in the 125 Years Anniversary Celebration. Weingut Gunderloch is close to our heart for several reasons. To begin with, when my wife Annette and I studied in Mainz, Germany, and had our first children, we regularly used to go to the cosy wine tavern of Weingut Gunderloch by bike on Sunday afternoon, had a couple of delicious Gunderloch wines and a Spundekäs (local cream cheese) with Bretzels. Second, for the time we have been based in Washington DC (from 1983 onwards) Weingut Gunderloch was one of the leading wine producers in the US. Fritz Hasselbach told me that during the peak, he was once a month in the US, where his wines are imported by Rudi Wiest selections. Third, Johannes Hasselbach is one of the 4 creators of the Wurzelwerk project. Annette Schiller organized their first presentation in the USA last year. Weingut Gunderloch has 24 hectares of vineyards. In Nackenheim, there are holdings in the Rothenberg (Riesling), the Engelsberg (Riesling, Silvaner, Ruländer and Gewürztraminer) and the Schmitts Kapellchen (Scheurebe and Müller-Thurgau). In Nierstein, there are holdings in the Pettenthal and Hipping both planted with Riesling and the Paterberg with Ruländer and Müller-Thurgau. Weingut Gunderloch used to be export-oriented and well known in the US, with more than 50% of the production sold abroad. Johannes Hasselbach’s objective is to increase the domestic share in its sales, although the US will always remain a major market for Weingut Gunderloch. The property and vineyards have remained in family ownership since the days of Carl Gunderloch, who died in 1935, the estate passing first to Gunderloch's granddaughter Elizabeth Usinger and her husband. They remained at the helm until 1965, when their son Carl Otto took on the management of the estate. Until recently, his eldest daughter, Agnes Hasselbach-Usinger and her husband, Fritz Hasselbach were in charge. Agnes and Fritz developed a strong presence in the US, with wine importer Rudi Wiest in California. Gunderloch wines are available throughout the US. Agnes and Fritz have 3 children. Daughter Kathrin Hasselbach-Bordiehn is pursuing other interests outside of the estate. Daughter Stefanie Jurtschitsch studied oenologie at Geisenheim University, where she met Alwin Jurtschitsch from the famous Weingut Jurtschitsch in Austria and married into this winery. She lives with Alwin in Austria now and makes Jurtschitsch wines. Son Johannes Hasselbach, with his wife, has taken over the winery. He initially studied business economics before turning to winemaking. It will be interesting to see in what direction Johannes will steer the winery. The Gunderloch Estate also has an interesting tie to the German dramatist Carl Zuckmaier. Zuckmaier, who became a Hollywood screenwriter, was born in Nackenheim and a friend of Carl Gunderloch. Zuckmaier not only wrote the screenplay for the film "The Blue Angel", but also the plays "The Captain from Koepenick" and "The Devils General". He also used the Gunderloch estate for the setting, and Carl Gunderloch as the main character for his very first play "Der fröhliche Weinberg" (the jolly vineyard). In this play Zuckmaier renamed Carl Gunderloch "Jean Baptiste" which is where the brand name used on the Gunderloch "Jean Baptiste" Kabinett is borrowed from. 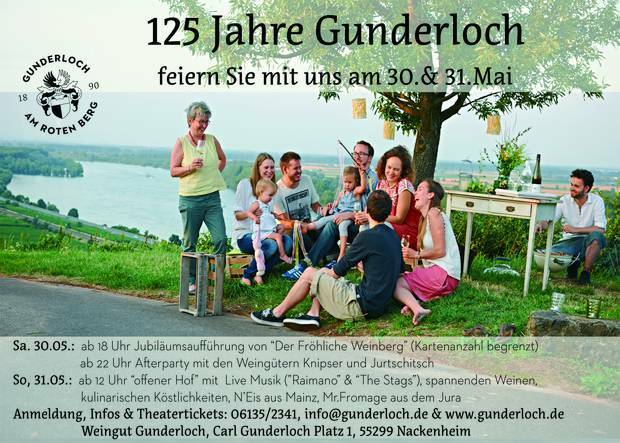 The celebration took place at Weingut Gunderloch during the last weekend of May. At the center was a special performance of the "Der fröhliche Weinberg" of Carl Zuckmaier at the estate. “Wurzelwerk und Winzers Beitrag” (Root Work and Winemaker’s Contribution) is a fascinating and much talked about project of 4 winemaker friends/relatives from 3 world class wineries in Germany and in Austria. Starting with the vintage 2012, Max von Kunow (Weingut von Hövel, Saar, Germany), Johannes Hasselbach (Weingut Gunderloch, Rheinhessen, Germany) and Alwin + Stefanie Jurtschitsch (Weingut, Jurtschitsch, Kamptal, Austria) shared a portion of their Riesling grapes with the other 2 wineries and vinified the own portion as well as the 2 portions from the other 2 wineries into 3 separate wines. Thus, they make a total of 9 different wines. The first presentation of the Wurzelwerk project outside of Germany took place in Washington DC and was organized by Annette Schiller. VIRGO is another interesting project of Johannes Hasselbach. VIRGO is a wine fermented in the vineyard. The purpose of this is to minimize the impact of wine cellar flora and yeasts on the wine. The grapes come from the Grand Cru vineyard Rothenberg. VIRGO thus could mean: “Vergoren Im Rothenberg Ganz Ohne” (Fermented in the Rothenberg without Anything). Alternatively, it could be the Latin word for virgin. Johannes started the project with the 2010 vintage (only 2 bottles). Here are the tasting notes of Bernd Klingenbrunn from K&M Gutsweine in Frankfurt for the following 3 vintages (in German). Steinige, salzige Aromatik. Jahrgangstypisch genauso kraftvoll wie sein “Bruder GG” aus dem Keller. Wirkt in sich geschlossen, viel Energie ausstrahlend, kraftvoll, aber nicht fett, ein in sich ruhender Wein, perfekte Balance, wirkt wie selbstverständlich. Für mich auf gleichem Niveau wie das “normale” Rothenberg GG. 96/100 Pkt. Kaum vorgeklärt, recht schlank auf mich wirkend, würzig, etwas weniger kraftvoll als der 2012er V.I.R.G.O. Gute Balance. Auf mich wirkt dieser Wein etwas weniger offen wie sein “Keller-Pendant” 92/100 Pkt. Right behind them are another 20 winemakers, who got 4.5 out of 5 points: The runners-up. Here is a listing, with a short introduction of each of them. The Geheimer Rat Dr. von Bassermann Jordan Estate was established in the 1700s by Andreas Jordan, who had immigrated to the Pfalz from the Savoy region. When he died in 1848, his bequest was split three ways – an event known as the Jordansche Teilung (Teilung means “division” or “sharing” in German) – giving rise to Deidesheim’s three biggest wineries, which thenceforth developed independently of each other and still exist today. Today, they bear the names Geheimer Rat Dr. von Bassermann-Jordan, Reichsrat von Buhl and von Winningen (Dr. Deinhard). They are now all owned by wife of the late Achim Niederberger. 49 hectares. Weingut Battenfeld-Spanier is in Hohen-Sülzen (Wonnegau area) close to the city of Worms in Southern Rheinhessen. The Spanier family has been making wine for generations. The vineyard area totals 18 hectares, with holdings in: Kirchenstück, Rosengarten und Sonnenberg (Hohen-Sülzen), as well as Frauenberg (Flörsheim). More than 50% of the area is planted with Riesling, as well as with Pinot Noir (20%), Pinot Blanc (8%), Silvaner, Chardonnay and other varieties. Weingut Battenfeld-Spanier is fully biodynamic. Weingut Becker is in Schweigen in the Pfalz, right at the French/German border. The vineyards totals 18 hectares. Unusually, about 2/3 of the vineyards are located in what is now France. Weingut Friedrich Becker is one of the best producers in the Pfalz and one of the best Pinot Noir producers in Germany. The best Becker Pinot Noirs compare favorably with the best Burgundy has to offer. Picture: Annette Schiller and Friedrich Becker sen.
Dry-only producer from the Pfalz, headed by VDP President Steffen Christmann. The vineyard area totals 20 hectares, with Riesling accounting for 2/3 of the production. In the Nahe Valley with 22 hectares. Grape Varieties: 65% Riesling, 20% Grauburgunder, 10% Spätburgunder, 5% Weissburgunder. Bottle-fermented (and hand-riddled) sparkling wines are also produced. A typical producer in the Franken area, with Silvaner and Müller-Thurgau accounting for more than half of the production. 15 hectares. A respected producer from the Rheinhessen area, which is well established in the American market. It all started in 1890, when the banker Carl Gunderloch purchased the Gunderloch manor house in Nackenheim. Today, the Estate is still in the hands of the Gunderloch family, with Johannes Hasselbach in charge. 18 hectares. The Haart estate includes four vineyard sites on the left bank of the Mosel and one on the right. Most prominent are its 4 hectares in the heart of the Piesporter Goldtröpfchen vineyard. 7 hectares. Weingut Dr. Heger in Baden was established in 1935 by the rural doctor, Dr. Max Heger. Today, the 21 hectares of vineyards are predominantly planted with the Pinots Gris, Blanc and Noir. In addition, there is also the Weinhaus Heger, a negiciant, which the current owner Joachim Heger founded. With his only dry and terroir-driven wines, Reinhard Löwenstein is sometimes called the rebel from the Mosel. 14 hectares. Weingut Bernhard Huber in Baden is one of the winemakers leading the German red wine revolution. 26.5 hectares. Bernhard Huber, only 53 years old, died in June 2014. His son Julian Huber has taken over, with the help of his mother Barbara. This family estate is run by Peter Jost, who took over from his father Toni in 1975. Peter was joined by his daughter Cecilia in 2009. It is based in Bacharach, in the south of the MittelRhein region. 15 hectares. All dry wines. Situated in Assmannshausen in the Rheingau region, the wine estate of August Kesseler consists of vineyard sites in Lorch (for Riesling and Silvaner wines), on the slopes of the hills around Rüdesheim and Assmanshausen (Pinot Noir). August Kesseler took over the estate from his parents in 1977 as a young man, and has qualitatively expanded the best area under vines to 18 hectares. A dry wines only producer from the Pfalz. Half of the vineyard area totaling 40 hectares is accounted for by red wines, with the focus on Pinot Noir and half accounted for by white wines, with the focus on Riesling and Pinot Blanc. Weingut Andreas Laible is in Durbach in the Baden region. The vineyard area totals 7 hectares, with Riesling accounting for more than half of it. All wines are dry. Weingut Ökonomierat Rebholz in the Pfalz was founded by Hansjörg Rebholz’s grandfather. In the tradition of his grandfather, who was aiming at producing "natural wines" and these "with the precision of a Swiss watchmaker", Weingut Ökonomierat Rebholz is now fully biodynamic. Weingut Salwey in Oberrotweil in Baden specializes in Spätburgunder, Grauburgunder and Weissburgunder. Konrad Salwey is at the helm of the winery since 2011, when his father Wolf-Diedrich Salwey died in a car accident. 40 hectares. The vineyards in Oestrich, Winkel and Hattenheim in the Rheingau are planted with 97% Riesling and just 3% Spätburgunder grapes. Brothers Bernd and Andreas Spreitzer are the fourth generation of the Spreitzer family to run this historic estate where wine has been produced since 1641. 15 hectares. The Stodden family has been dedicated to producing wine since 1578 in the Ahr Valley. The 6.5 hectares of vineyards are almost exclusively planted with red grape varieties: Pinot Noir (88%), Frühburgunder (6%)) and Dornfelder (1%). The most spectacular wines Alexander Stodden, the current owner and winemaker, produces are terroir-driven Pinot-Noirs from top vineyard sites such as the Recher Herrenberg. Florian Weingarts 6.5 hectares are divided between 3 sites on the Bopparder Hamm in the Mittelrhein Region, a south facing stretch with an incline of 50-70% along the Rhein where a kink forces the river to flow west to east. Here slate is layered with various sedimentations and volcanic ash spattered during eruptions of Eifel Mountain over 10,000 years ago. The Bourgogne Tour by ombiasy WineTours in 2015 was organized for a special group, the Wine Brotherhood of Hochheim, Germany (Weinfreundeskreis Hochheim). The tour took place from March 31 to June 6, 2015. The 2015 Bourgogne Tour, for the Wine Brotherhood of Hochheim, began and ended in Hochheim, which is close to Frankfurt: From Frankfurt – via the Champagne, Tonnerre and Chablis – we headed to the southern tip of the Mâconnais and from there worked our way up to the north through the famous vineyards of the Bourgogne - Côte Chalonnaise, Beaune, Côte de Beaune, Côte de Nuits – back to Frankfurt. (As an aside, next year, in 2016, the Bourgogne Tour by ombiasy WineTours will begin in Lyon and end in Paris. Presumably, we will all fly into Paris and take the TGV to Lyon, the culinary capital of the world. We will move northwards from there (by coach), back to Paris: Lyon, Beaujolais, Mâconnais, Côte Chalonnaise, Beaune, Côte de Beaune, Côte de Nuits, Chablis, Champagne, Paris. The following provides you with photo impressions from the 2015 Bourgogne Tour, with a few photos from previous trips. The Bourgogne is one of the most famous wine regions in the world. Most of the wine produced here is Pinot Noir or Chardonnay. Chablis and Beaujolais are formally part of Burgundy wine region, but wines from those subregions are usually referred to by their own names. Some way south of Chablis is the Côte d'Or, where Burgundy's most famous wines originate. All Grand Cru vineyards of Burgundy (except for Chablis Grand Cru) are here. The Côte d'Or is split into two parts: the Côte de Nuits in the north and the Côte de Beaune in the south. The wine-growing area is just 40 kilometres long, and in most places less than 2 kilometres wide; the area is made up of tiny villages. Further south is the Côte Chalonnaise, where a mix of mostly red and white wines are produced. Below the Côte Chalonnaise is the Mâconnais region, known for producing easy-drinking and more affordable white wine. Further south again is the Beaujolais region. The Bourgogne (including Chablis but excluding Beaujolais) covers a total of 28,000 hectares. Côte d'Or covers 8,000 hectares. Monks and monasteries of the Roman Catholic Church had an important influence on the history of Burgundy wine. As the power of the church decreased, many vineyards which had been in the church's hands, were sold to the bourgeoisie from the 17th century. The Napoleonic inheritance laws resulted in the continued subdivision of the most precious vineyard holdings, so that some growers hold only a row or two of vines. Clos Vougeot, for example, which was a single 125 acre run by the monks, today is parceled into plots owned by nearly 80 different owners. This led to the emergence of négociants who aggregate the produce of many growers to produce a single wine. Négociants play a vital role in the Bourgogne, ranging from simple labelling and distribution, to carrying out the entire wine-making process. Négociants may supply wines at all quality levels, including Grand Cru. Grand Cru wines are produced from a small number of vineyards in the Côte d'Or and make up 2% of the production at 35 hectoliters per hectare. The origins of Burgundy's Grand crus can be found in the work of the Cistercians who, among their vast land holdings, were able to delineate and isolate plots of land that produced wine of distinct character. There are 33 Grand Cru vineyards in the Bourgogne. Subregional appellations cover a part of Burgundy larger than a village. Examples are Hautes-Côtes de Beaune and Mâcon-Villages. Pictures: At the Hospices de Beaune with Karoline Knoth, M.A.